This week’s photo of the week is another image taken on my trip up to Jasper a couple weeks ago. I’ve been sharing a lot of wide angle landscape scenes from the trip since I got back, so I thought I should show something a little different for this week. When the mid day light get harsh and less conducive to capturing the big scenes, I often switch up to my macro or telephoto lens and start looking around on the ground for details like this one. 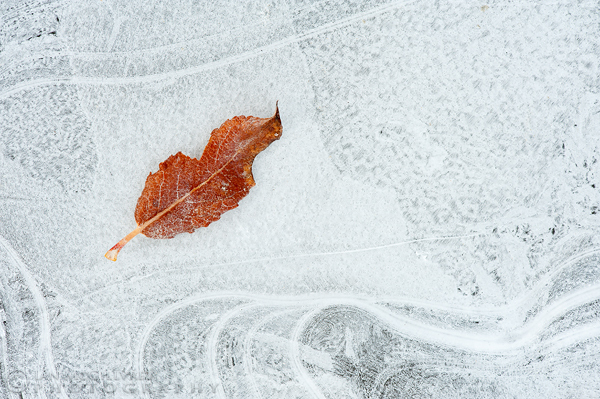 In this case, I was using my 105mm f2.8 macro lens and got down pretty close to the ground to frame up this leaf within the lines in the ice. The leaf is maybe only about an inch long, to give you an idea of how small this little scene was. The biggest challenge was probably just not wrecking the shot by breaking the thin fragile ice with my tripod legs while getting into position! It’s a pretty simple one really, just a leaf on some ice, and I liked the way it looked. Hope you do too.